The adjectives in the title might be a bit of a stretch, but a pair of slortz are almost irresistible to first time adventure oriented travelers to the tropics. Slortz- zippered, slack, pants, shorts things. Columbia Convertible Pants are quick dry and include a hidden passport pocket. 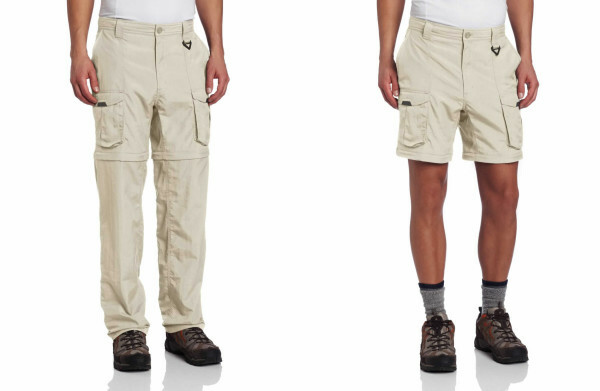 Slortz is the best one word moniker I could conjure for the cargo style travel slacks with zip off legs for conversion into a pair of shorts. Slack-shorts-pants-zip things. They could start as shorts when you’re hiking along the beach by Naranjo, but when you move into the regenerating pasture closer to Hacienda Santa Rosa, long pants tucked into your boots are strongly recommended to avoid a horrible week of insanely painful itching from the chiggers in the grass. Zip the legs on and off you go. Now that is clever, and functional as well. The problem with the scenario above is that I forgot to mention that in order to accomplish the conversion with some brands you have to sit in the mud swatting mosquitoes, remove your boots, slip the leg extension tubes on, zip them up, rip the pants off, shake out the centipede that crawled in while you were sitting in the mud, replace your boots and tuck in the pant legs. Look for a pair that zip open on the side seam as well so the leg extensions go on like a pair of gaiters over your shoes. Maybe stylish isn’t exactly the right word, but they certainly make a fashion statement. Sort of like Bermuda shorts and a Hawaiian shirt in Chicago, you’ll never be mistaken for a local when you’re sporting a pair of these.